Love at first sight might be the right expression in the case of the Spring Summer collection from .normaluisa. Its nonchalant, chic, feminine and even a tad glamorous. The cuts, the flower prints nor the pleated skirts may not be very original but the elegant fabrics, the romantic light, cream colors and the striking yellow makes the outfits so desirable for a gorgeous sunny day. I'd rather would've seen the chunky gold chains in a statement necklace version (or not at all) and the black patent pumps changed with elegant sandals or peeptoes... I've picked my favorites to share but the collection has many more great outfits, you can see them all on Vogue. Would love to hear your thoughts! p.s. Thanks so much for the Paris tips, I've written them all down. I really like the femininity and shapes of these pieces. There's a nice graphic impact and those belts are lovely. I'm not liking the gold chains around the ankles. They seem heavy and out of place. Very feminine design indeed, well except for the gold chains. What's that all about? ;-) These are not my colours but I love the way they scream spring. 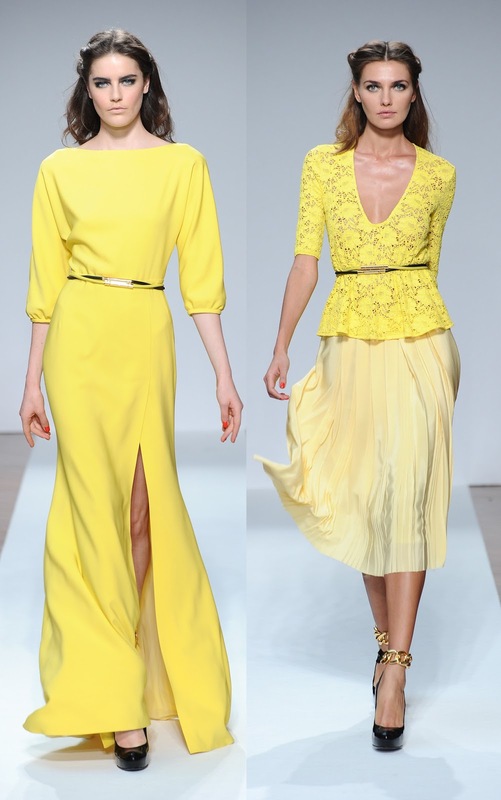 I love the 2 yellow dresses - even though I rarely wear yellow!! And, agree.....something strappier and not black would have offset these beauties even more. It's Fashion Week in NYC and I'm heading in this afternoon. Wonder who I might see! That first yellow dress is gorgeous! I would take all of it, thank you! And those little skinny belts on all the models are soooo chic! Hope you have a wonderful weekend!